This post was contributed by Kim of The Educators’ Spin On It. 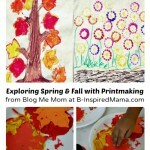 Looking for a fun way to experience Fall with your kids? How can you connect books with learning, fun and using your imagination? 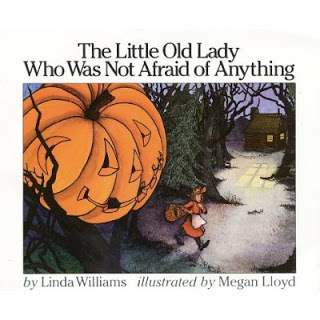 Year after year while teaching Kindergarten I loved reading this book, The Little Old Lady Who Was Not Afraid of Anything by Linda Williams. This book is so much fun. 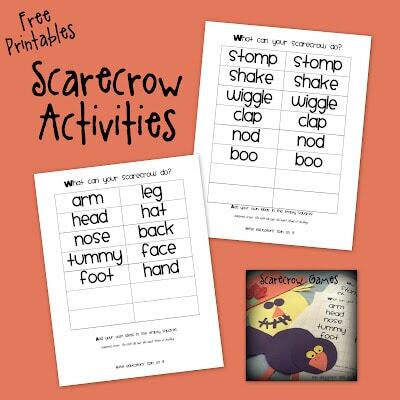 It’s an engaging way to talk about scarecrows and the spooky things of Fall at the same time. This time of year can bring a feeling of fear into our children’s worlds at times. This book has a fun way of showing how to be brave and put your imagination to good use. As a participant in our Love Books Exchange this summer, Krissy shared her post about the Emotion Cards Game which is a helpful one for this time of year. 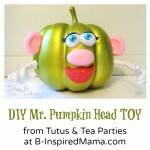 You can use it to create pumpkin or scarecrow faces too! It’s a great way to talk about how we feel in different situations. We planned a play date around the book The Little Old Lady Who Wasn’t Afraid of Anything and thought it would be fun to share with you. So grab your book and let’s have fun with a little old lady and her adventure going home in the dark forest one evening. 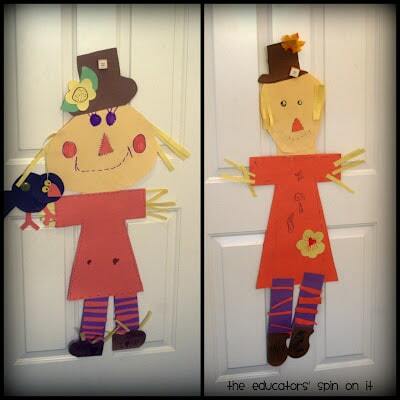 Make your own Scarecrow: Using Construction Paper of various colors, let your children get creative with building their very own scarecrow. We used a dress for our girl scarecrow but you could easily just create a square shirt and pants for a boy scarecrow. Once they’ve cut out the shapes have them decorate it. We drew a few stitch marks to pretend we had sewed our scarecrows together. We did this as an open ended project our participants, I love how each of them turned out so differently. 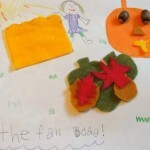 We made precut pieces for the younger ones in the group too so everyone could participate. Where is the Crow? 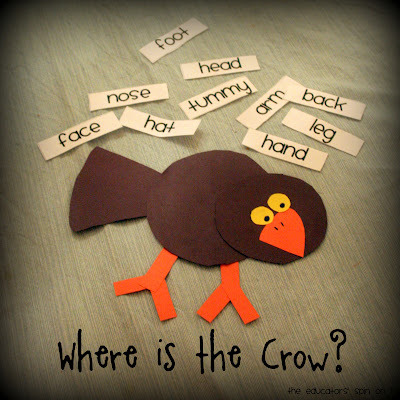 – We also made our own crows out of two circles, triangle and added our own beaks and feet and eyes. Then it was game time. We printed out the game pieces and they got to draw a card and put the crow where the word said to place him. Here’s the Printable. For younger kids, it’s working on identifying body parts for older ones it’s working on reading those words. Great Sibling fun! Move Like a Scarecrow– Just like in the story the pieces of clothes have movements as the little old lady discovers then. Now it’s your turn. As you draw a movement card you get to move like the scarecrow. Here’s the printable of movement cards. Crow Racing– Using a crow you’ve created, it’s race time. Move your playdate outdoors and grab a scarecrow. 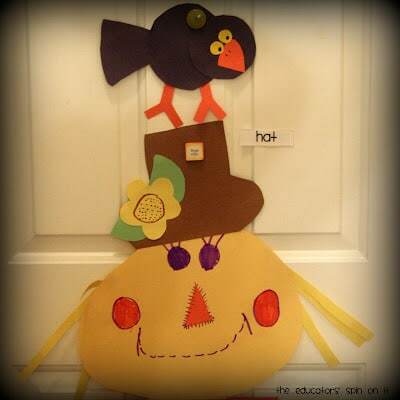 Pretend to be the crows racing around the scarecrow outdoors if you have one or just hang the one you created. 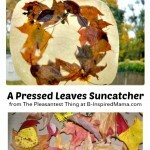 This works great with a play group! Hope you have fun on your scarecrow adventures! 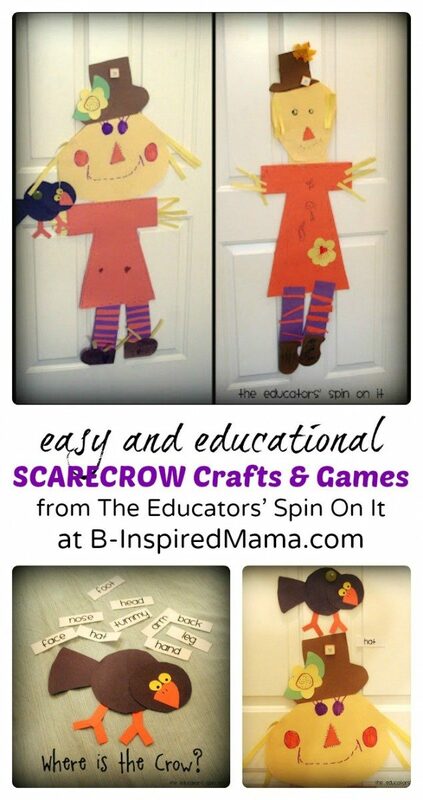 We will be sharing more scarecrow crafts and games on The Educators’ Spin On It; we invite you to stop by. While you’re there we invite you to check out our 40 Activities for Fall and join our Virtual Book Club for Kids. And if you can’t wait stop by our Love Books Page to find book related activities for fun with your little on. Happy Fall! Kim is a co-author of The Educators’ Spin On It . As a early childhood teacher and a mom of three, she’s learned many tips and tricks of parenting and teaching along the way in the past 20 years. 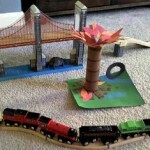 She shares her “Educator’s Spin” on parenting issues and how make learning playful and playtime meaningful. 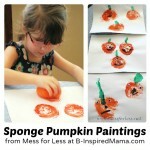 You can also find The Educators’ Spin On It on Facebook and Pinterest. Ooh, what a great scarecrow unit! 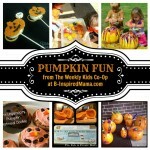 Thanks so much for linking up to Discover and Explore this week! I must get a copy of that book ! 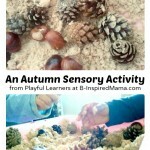 Love the ideas on this post – will definitely be using them with my little one – thank you. Wow! I love your ideas! I can’t wait to try them in my classroom! I think the crow is my favourite. But it is all so cute! What wonderful ways to work on words! I love your scarecrows! Thank you for linking to Read.Explore.Learn. I am featuring this post on the Read.Explore.Learn. Facebook page tonight. 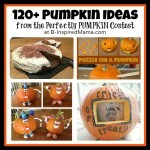 Thank you so much Krissy for asking us to guest post on your site! We hope you readers will enjoy! Your scarecrows turned out so cute!